Goa is famous around the world for its beaches and party vibe. Hippies have also made it their home but apart from the laid back atmosphere, I haven’t seen what I would called “real hippies”. It seems they are further north. We stayed in Vagator, right beside Anjuna, where party people enjoy trance music on the beach during the day and go clubbing at night. Loads of (younger) travelers and Russians (?) frequent this destination. It’s easy to find a place to stay, the typical accommodation being a hut near the beach. 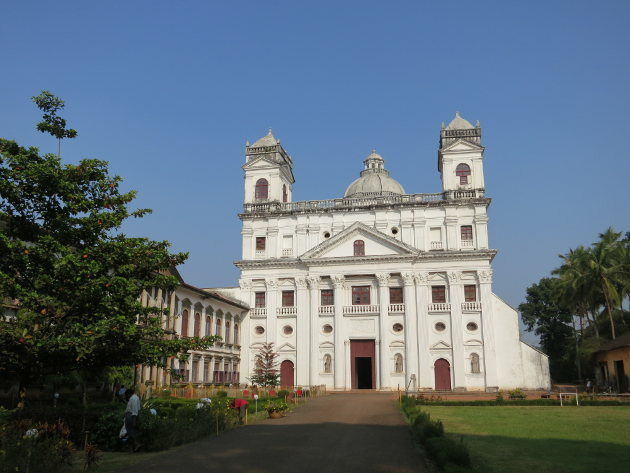 Goa was owned by the Portuguese until the mid 20th century and you can still see their impact with all the churches and convent around. It’s quite weird to visit big cathedrals in India (located in Old Goa). The Portuguese went really all-in with their evangelisation here, building 3 big cathedrals in a 500m radius! Getting around is pretty easy. We took the local bus from Vagator to Old Goa, which while very cheap is a long ride. I would still recommend it as the organized tour are much more expensive (70 rupees vs 500 rupees) and it’s fun to ride with the locals. The most common way to drive around is to rent a scooter but do it early in the day. We waited until the afternoon and couldn’t find any left to rent. I have to say that I wasn’t really impressed with the beaches and while partying all night is great once in a while, doing it every night is not my thing. It’s a shame we didn’t have more time because I would have liked to visit the inner Goa, doing a some trekking in the mountains where there seems to be an amazing wildlife.